It was in the night that he came back to them, the stranger they called, “That Homeless”. His return was preceded by a curse that overtook the neighborhood of Almer’s Way. The curse was a pillar of dark and foreboding cloud that suddenly appeared in the sky over the neighborhood. It slowly collected after dusk, in small thin tendrils that wound like threads through the streets and back alleys of the neighborhood. When it was fully formed it appeared as a dark clumping mass of smog that then rapidly began to amass and take shape. It descended between tall buildings and homes, and upon the simple people of the neighborhood. Growing down from the sky, forming like an insect’s pupa, dangling to the ground. It was as if it was made from the pollution of the city itself, a caustic haze that choked out the air, and traveled independently from the night sky. Dulling the dotted silver lights from downtown Distinct Poplar and the other neighborhoods that surrounded it. As if to come and claim this particular neighborhood of Almer’s Way for it’s self. It spilled across the neighborhood uncontrolled and uncontested. Rolling over the very concrete, the cars, street signs, and the people who stood outside watching in fear as it descended upon them. Men and women stood outside their homes and businesses with wide eyes watching it engulf everything around them as it passed. The cloud made it’s way through the neighborhood’s alleys and side streets, expelling itself into the very homes of the people who lived in Almer’s Way. Invading through windows left open, cracks in the walls, and old chimney stacks. Eventually the caustic haze blanketed every street and every street corner, every block with every home and every storefront. Sticking to the neighborhood like a noxious film, attaching itself to everything and refusing to let go. Like a wall of thick, evil smoke that no breeze or stiff wind could send away. Every man of Almer’s Way became sick, collapsing over their arms, clutching their belly in pain. Their heads laid in the laps of the women whom shifted nervously in the presence of blank stares looking back at them. Lost were their eyes, their skin became ashen and white. Mouths began to go slack, tongues fell from between teeth and lolled out from between pale lips, swollen and colored like liver. Helpless, the men were carried home on the broad shouldered backs of wives and mothers, of sisters and aunties, of daughters and nieces. A lumbering parade that patiently proceeded along in a one by one line of the sick and powerless. Step by step for husbands, step by step for brothers and sons, step by step for uncles, and nephews and cousins. One by one to be put to bed, under thick green army blankets andwrapped up tight in old family quilts to warm their shivering bones. The women of Almer’s Way gave their men medicine; sticky syrups and gelatin pills, tablets that fizzed in water, and chalky pink liquid. They stirred their fireplaces and raised their thermostats to warm cold flesh. Whispering prayers, they waited for phone lines that seemed out of order, and cell connections that seemed to die instantaneously... but it was no use. The mouths of their men only spoke nonsense and there was nobody present who could make sense of their words. The women eventually grew too anxious for their own good. Time became a matter of itself, all of the sick husbands, brothers, and sons began to worsen. That was when the stranger they had called “That Homeless” returned to them...but this time he was not alone. He returned dubiously from his trip to the old abandoned house on Clemens St. When he had come to the neighborhood in the last week he wasjust a passing drifter. He ate with the other men and drank with them before he was on his way. He had said very little before he had departed and nobody had discerned much about him. 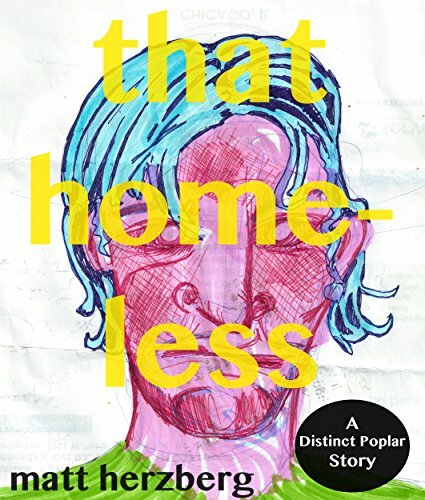 He came to be known as That Homeless, which was what anyone had offered to call him. “Do you remember, That Homeless?”, they had gossiped, “What did he want with that old house on Clemens St?” Nobody knew for sure, just that he had been headed there with insufferable indignation and driven with a strict and determined purpose. Now he had returned to the neighborhood and it was sudden and unexpected. An ominous and oversized silhouette floated through the face of the very fumes that had beset the people ofAlmer’s Ways. Something they thought was a trick of the fading city lights around them. Like an enormous shadow that was cast from the last rays of the neon hum and glow of surrounding streetlights and electronic billboards. A shade, thats what they thought he was at first, a shade that loomed ominously above the approaching man that they had dubbed, That Homeless. Walking exactly as he did, imitating exactly what he was, following exactly where he went...the shadow was him and he was it. And he was overlooking them all with a strange, empty glare. By the hand the man pulled a boy who looked older then his years, about the age of twelve or thirteen. The boy gradually followed but spoke to the air as if another person also walked beside them. That Homeless’s other hand was empty, where before there had been a makeshift dagger that he would never have let go. Something some of the men had called “shiv”, something that he’d arrived with the first time. Something he had taken with him to the house on Clemens St, but had not made the trip back. The women could hear the boy as he excitedly spoke to the nothing and the nobody. Thats what they called it here; when the simple minded spoke to nobody in particular, when those under duress of thought seemed to speak to only themselves, when children chided with their imaginary friends. The nothing and the nobody. The boy’s voice was like the shrill call of a bird that sung to them, a call that echoed from building to building and from home to home. It called the women from the bedsides of those that they cared for. Taunting them with it’s very existence, the boy’s very words transforming into a lure that could not be resisted. A healthy boy, it called to them, a happy boy who’s not sick. Come see! Come see! So the women did come to see him, over come with their grief and curiosity. This modern fairytale tells the story of a city neighborhood called Almer’s Way and the strange sickness that has claimed half of it’s residents. Arriving in the form of a noxious cloud that envelopes the neighborhood, the people of Almer’s Way find themselves cut off from the rest of the city—with no way out. The only solution to these events seems to be a mute vagabond and the boy who heralds his unique story. They call him, That Homeless and his role to play starts with a haunted house, a monster, and a strange curse. Find out what happens in this short story of dark storybook fantasy and the magical modern marvel that is the city of Distinct Poplar.